Pop a few of these Kentucky Derby Pie Bites on Derby Day or any other day! Chocolate, Bourbon, and Pecans baked like Derby Pie and then dipped in a coating of dark chocolate! The Kentucky Derby is coming up! Are you busy planning your Derby Day Party yet? Do you have a big hat yet? Don’t worry, I haven’t either. 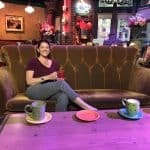 I’m busy getting ready to move into a new house and I am a fly by the seat of my pants kind of girl. I work best under pressure too so I usually wait until the last minute to do anything. This is not the best plan of action but for some reason, I keep doing it! I think it works because I get distracted so easily that if I try to plan too far in advance I never get it finished. But if I wait until the last minute, everything gets done. One thing that you will need to plan ahead a little bit, are the sweets you are serving at your Kentucky Derby Day party! 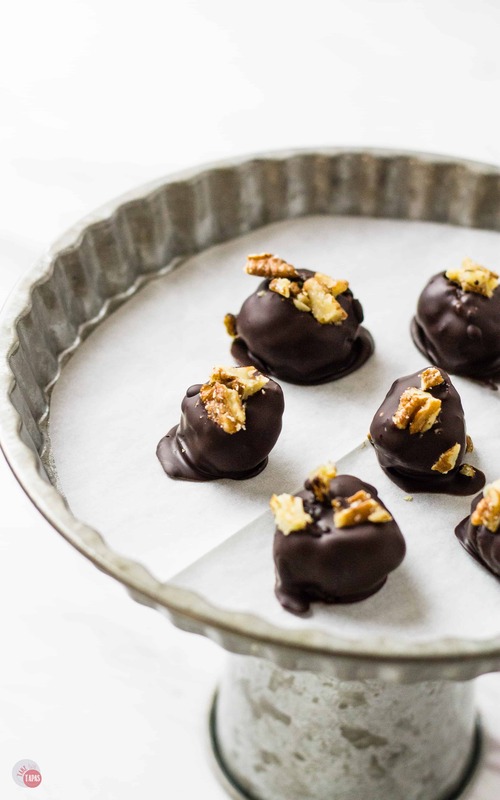 These Derby Pie Bites are made in two stages: the Derby Pie and making them into the truffle bites. Now you can buy a Derby Pie already made but I have had a hard time finding actual Derby Pies. I can find pecan pies all day long but not a Derby Pie unless you are in Kentucky. Most of us are not so it might be a little scarce. Now the difference between a Derby Pie and a pecan pie is the addition of bourbon and chocolate to a pecan pie. Now some will argue that walnuts are the nut of choice and not pecans. I love pecans so I tend to lean toward adding them instead of walnuts but you are happy to use your favorite nut. If you want to check out the nutritional benefits of each click here. Once you decide on which nut to use, make sure they are toasted first. I learned this trick from a friend which led me to my post on toasting nuts. I am terrible about forgetting my nuts in the oven and burning them, but toasting the nuts before you use them in your recipe enhances the nutty flavor and makes your recipe taste better overall. This is so true, so now I toast all my nuts in big batches and store them in my freezer. You can use them as snacks or in any of your treats. My tutorial on how to perfectly toast any nut is a great way to get started with making your Derby pie. Now that you have decided which nut to use and toasted it to perfection, get started baking your pie. You will need time to let the Derby Pie cool down before we dip it so plan for at least an hour after baking time for it to cool down. Now that your Derby Pie is baked and cooled down, time to make it into the Kentucky Derby Pie Bites. Because the pie doesn’t’ have a crust you can feel free to scoop the pie as you see fit. I prefer to use an ice cream scoop so that the bites are pretty close in size. These bites are pretty small ~approximately 1 teaspoon each~ but they pack a big punch of flavor! Once you scoop your pie into the pretty bite-sized balls, pop them in the freezer for about 15 minutes or so. 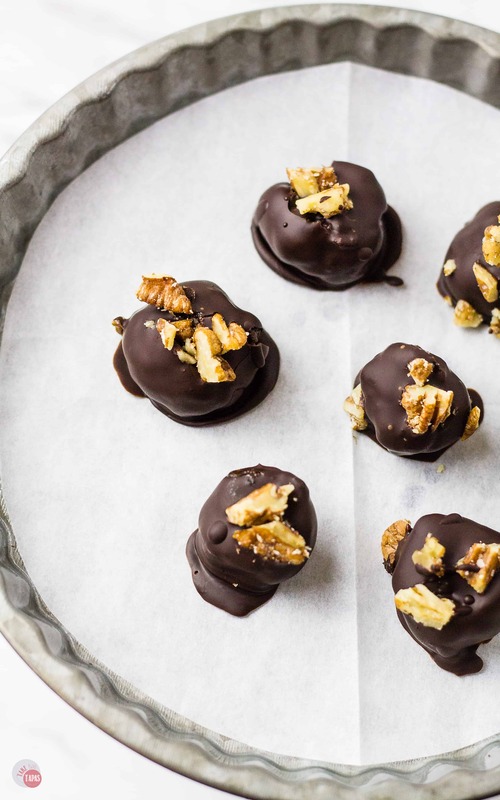 This will help them stay whole when you start to dip them in the dark chocolate. 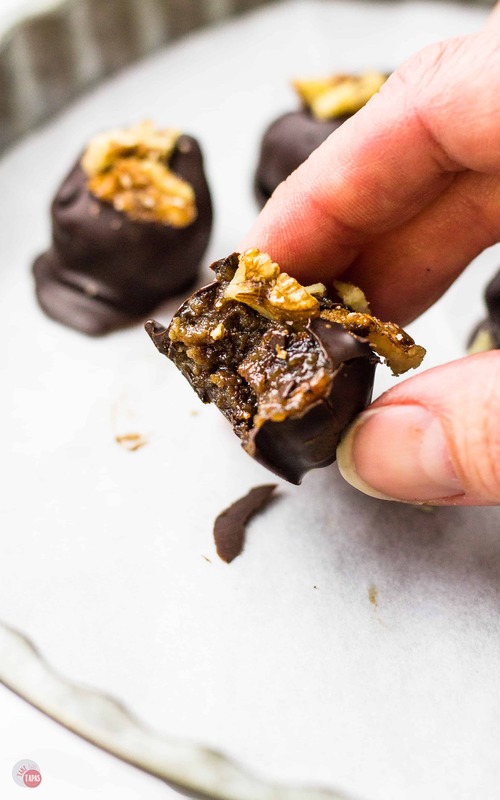 If you don’t freeze them beforehand, they will melt into a glob in the warm chocolate. A yummy glob, but a glob no less. I melt these dark chocolate wafers to dip most of my treats. They melt well and get shiny again once it sets. I used them in my Samoa Strawberries and they turn out so pretty! Once you dip the Derby Pie Bites in the chocolate put them back on the parchment-lined baking sheet they were on previously. It will still be cold so it will help the chocolate start to set. Dip two or three of them at a time. Once they are back on the baking sheet, sprinkle a few of the chopped pecans on top as a little garnish. Look how pretty they turn out! All the goodness of the chocolate, pecan, and bourbon pie, enrobed in crispy dark chocolate and topped with a nutty toasted pecan. Does it get any better than this? Maybe with a Mint Julep in the other hand? These Kentucky Derby Pie Bites last a few days in the refrigerator in an airtight container if they don’t get eaten first. Pop a few of these Kentucky Derby Pie Bites on Derby Day or any other day! Chocolate, Bourbon, and Pecans baked in Derby Pie and dipped in dark chocolate! In a medium-sized saucepan, combine the sugar, corn syrup, and butter. Cook over medium heat, stirring constantly, until the sugar melts and the butter is completely melted. In a separate bowl, combine the eggs, vanilla, bourbon, and salt. Slowly pour the sugar mixture into the egg mixture, whisking constantly to the eggs don’t scramble. Once all the sugar mixture is combined, add the dark chocolate chips and toasted pecans. Pour into a lightly greased pie pan. Bake at 325F for 50-55 minutes or until the middle is set and the top is starting to brown. Cool to room temperature and then chill in the refrigerator for at least an hour. Once the pie is cooled completely, get ready to dip the Kentucky Derby Pie Bites. Scoop your Kentucky Derby Pie into small bite-sized balls. I use this scooper to make uniform bites. Place the bites on a parchment-lined baking sheet. Freeze for 10-15 minutes to solidify them. 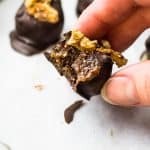 Melt your dark chocolate chips/wafers in a double boiler, slow cooker, or microwave while the bites are freezing. Dip your frozen Derby Pie Bites in the melted chocolate and place back on the parchment-lined baking sheet. 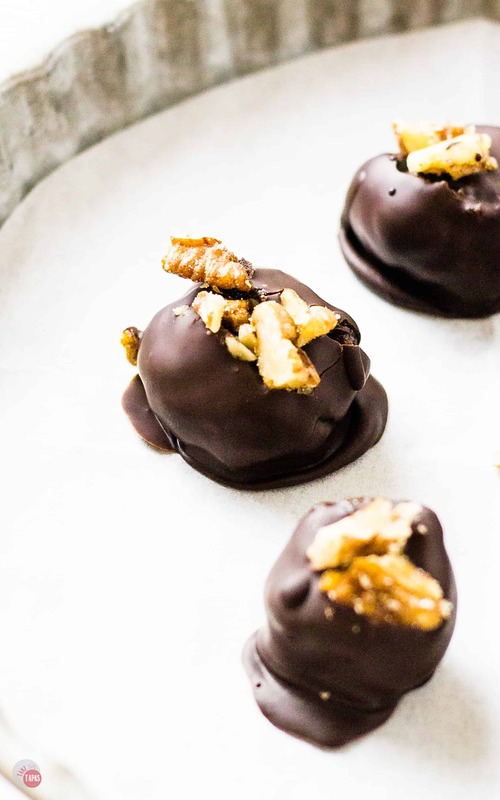 Once all the bites are dipped, place the baking sheet back in the refrigerator to set the chocolate. Store in the refrigerator in an air-tight container for up to 3 days. Seriously! Making Kentucky Derby Pie even BETTER!!! You’re like the Evil Genius of the Kentucky Derby Pie – Meant in a GOOD way!! I love the idea on the nuts, too. I burn mine a lot! I used to burn mine too! Ohmygoodness! I’d love to get my hands on these goodies! Thanks for the recipe — they’ll make an amazing treat!